Add Teeth Whitening to Your Next Checkup | Benjamin S. Fiss, D.D.S. Many people dream of having a white smile that stands out and brightens their entire face. Unfortunately, as many of our photos show, our smiles are often lacking in this area. Maintaining a white smile can be difficult. Popular drinks such as coffee, soda, and wine can stain the teeth and make them appear dull. Diet, poor oral hygiene, certain medical conditions, and smoking can also contribute to a lackluster smile. Professional teeth whitening can combat discoloration caused by daily activities and significantly improve the shade of your smile. Is In-Office Teeth Whitening Better? High pH levels: Over-the-counter products have a highly acidic pH level, far more acidic than the products used at your dentist’s office. This acidity is detrimental to your enamel because it contributes to demineralization (erosion of minerals on the surface of the teeth), thus contributing to the deterioration of your smile. Too small for your teeth: At-home products don’t always fit your teeth properly. Everyone’s mouth is shaped and sized differently, and over-the-counter products work with a one-size-fits-all philosophy. Because of this, if you have a larger mouth, the product may not be able to reach all of your visible teeth. 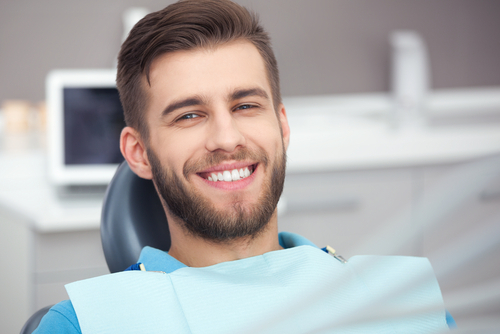 The trays often miss the back teeth, which creates displeasing and uneven discoloration. Too large for your teeth: If you have a smaller mouth, the strips or trays may be too large, causing the whitening product to sit against your gums. Hydrogen peroxide, while necessary for the whitening of your teeth, can be detrimental to the health and comfort of your gums. Dr. Fiss offers two different teeth whitening approaches to his patients. The first is the traditional tray method where he takes an impression of your teeth and creates form-fitting trays that are worn for an hour a day for seven to 10 days. Unlike the kits that you can buy in a store, these trays are customized for your mouth and are designed to help protect your gums from irritation. Dr. Fiss also performs the revolutionary ZOOM! procedure. This in-office treatment takes about an hour to complete; however, in that short period, results have shown that patients can whiten their teeth six to 10 shades brighter. This product combines bleaching light energy with a hydrogen peroxide gel that produces brighter and whiter teeth. Enjoy a more radiant, healthier-looking smile with an in-office teeth whitening procedure. All whitening products, in the office or at home, will only address the color of your natural enamel. Crowns, bridges, and implants will not respond to whitening products and may require further adjustment to ensure that all of your teeth have matching shades. Ask about our teeth whitening products during your next checkup with Dr. Fiss. To set up a consultation, contact his office by calling (312) 951-5230.